Technically speaking, white is not a color because it produces no visible light and has no specific wavelength. Instead, white light contains all wavelengths of visible light. Black, on the other hand, is the absence of visible light and therefore is also not a color. However, when it comes to point of purchase design, white can be extraordinarily powerful. In today’s blog we’ll look at 10 wood displays that utilize white to create a clean and simple look. Many of our customers who request wood displays want to showcase the natural characteristics of wood, but many others want to leverage the power of white to make their brand pop. Our first example is an MDF display with a white melamine finish that we designed and manufactured for Dreampad’s line of patented, high-tech luxury pillows. Our display was featured on a recent episode of Shark Tank. This knock-down MDF design included carbonized bamboo shelf accents, a digital media player and extensive vinyl graphics. Not only can white make graphics pop, but it can do the same for products. 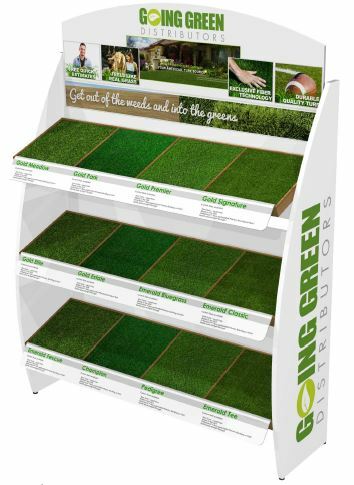 The artificial grass display we made for Going Green Distributors is a good example of that. The green turf stands out nicely against the white background and puts the focus on the product, which is where it should be. The two examples above utilize MDF with a while melamine finish. The Dr. Harvey’s shelf display shown below is also made of MDF, but on this display, we used a high gloss white painted finish to create a higher end look. The header and side graphics pop against the white finish, but more importantly, the product really stands out. 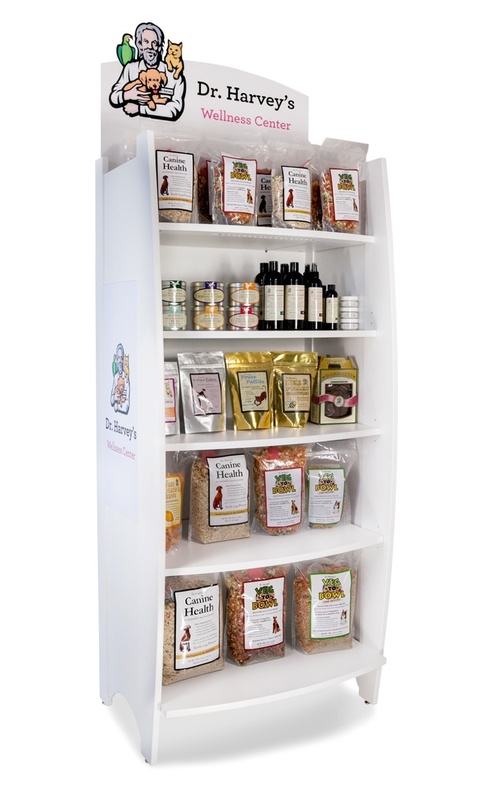 We incorporated LED lighting under each shelf which helped to create even greater focus on the products. 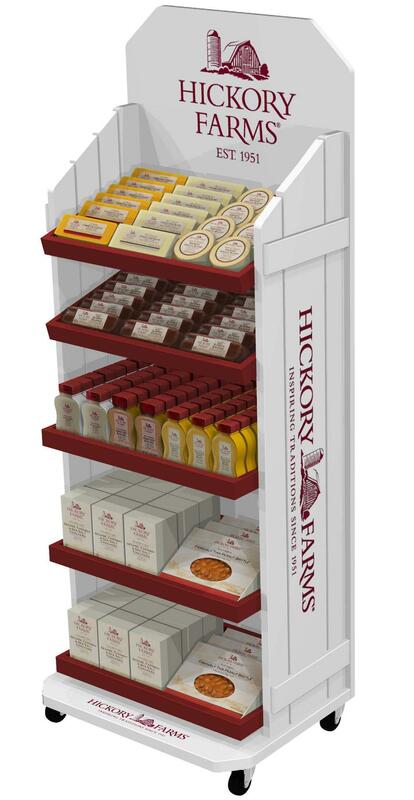 The Hickory Farms display we designed below is an example of a painted white finish on solid pine slats. The 4 red shelves create a nice contrast with the white we used on the rest of the display, and the combination of red and white work well with the logo and display graphics. The next two examples are displays we created for Modarri. 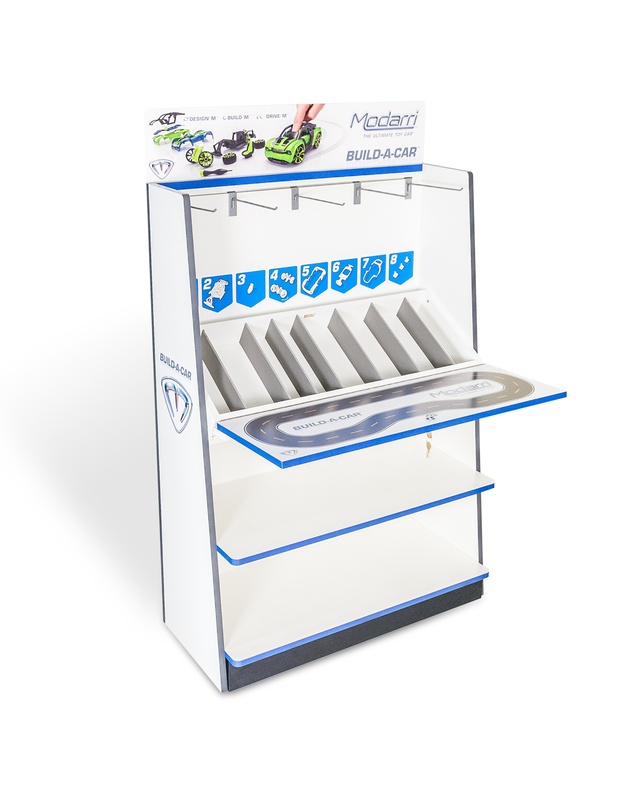 The first is a “Build-A-Car” fixture that enables kids to assemble a car at the point of sale and try it out on the fold-down track. There are a lot of unique features of this display, but the primary point is to show another example of how white can be used to make graphics and products pop. In this case, we used blue edge banding to break up the white and tie in with the graphics. 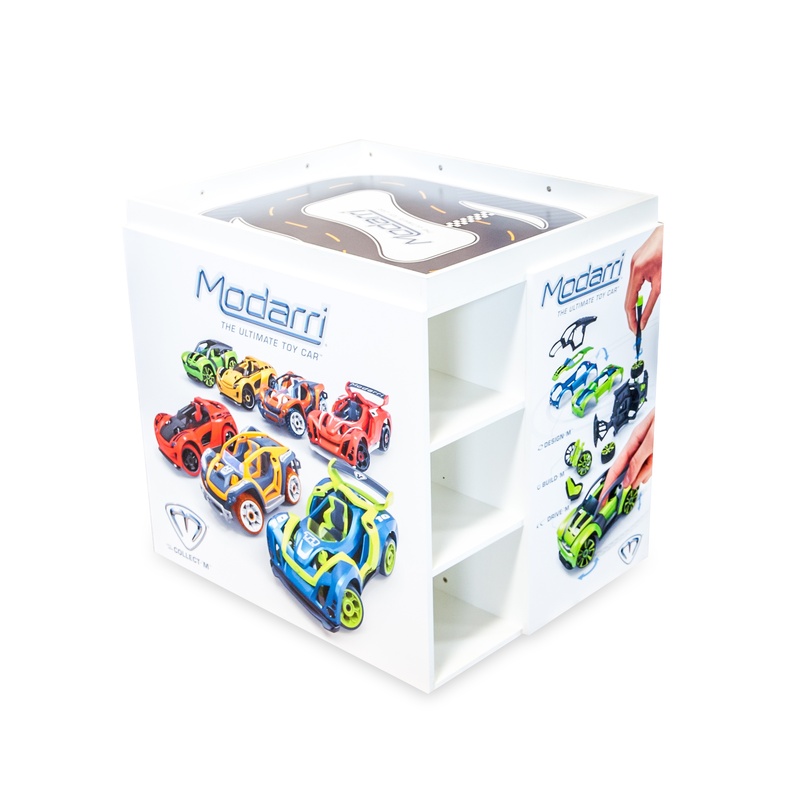 The second Modarri display shown below is an even better example of how colorful graphics can pop off a white background. Like the display above, we made this using MDF with a while melamine finish and used vinyl graphics with a protective overlaminate. 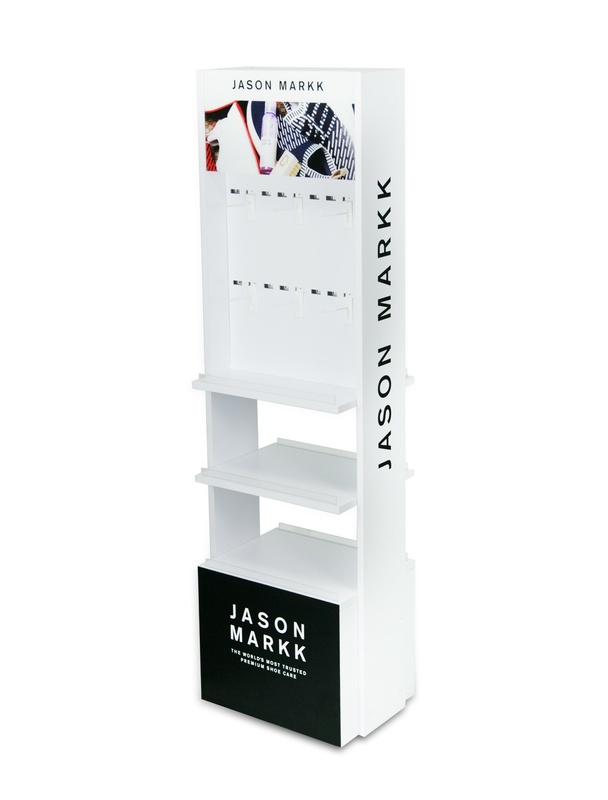 Our next example is a shoe care floor display we made for Jason Markk. The display includes shelves for boxed products and hooks for hanging items. The white MDF makes a great backdrop for the black base graphics, as well as the side and header graphics. 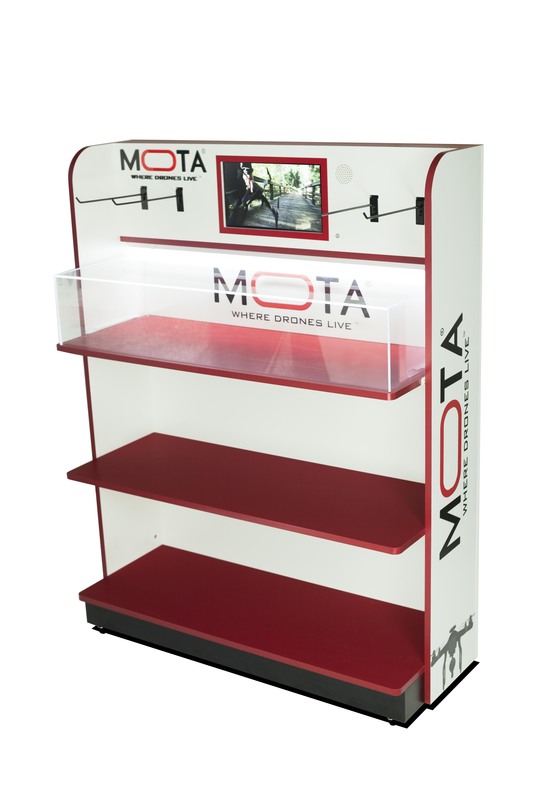 The Mota display shown below was designed to merchandise Mota’s line of drones in Fry’s stores. Like many of the other displays shown above, we used white MDF to create a clean look. We designed red shelves and red edge banding to tie into the logo colors. 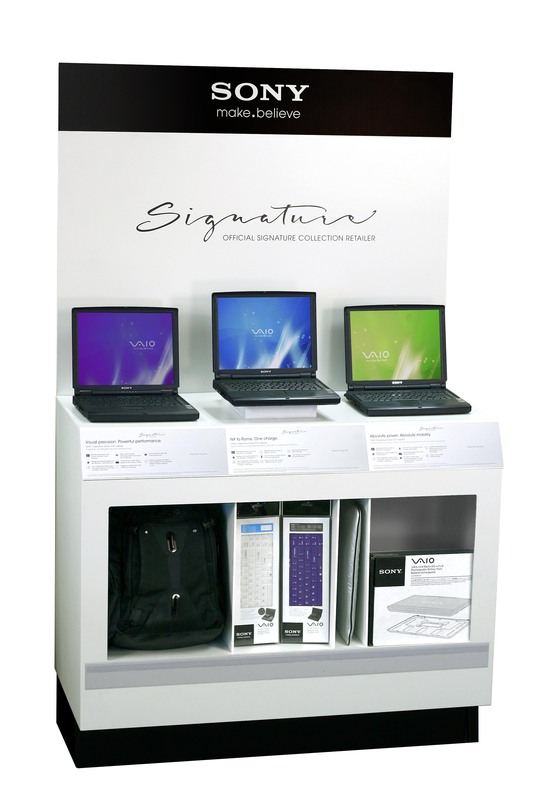 The shelves were designed primarily for boxed products, but we added an acrylic case to display out-of-the-box product. We also incorporated a digital media player with a looping video, 3D laser-cut acrylic letters and digitally printed vinyl graphics. 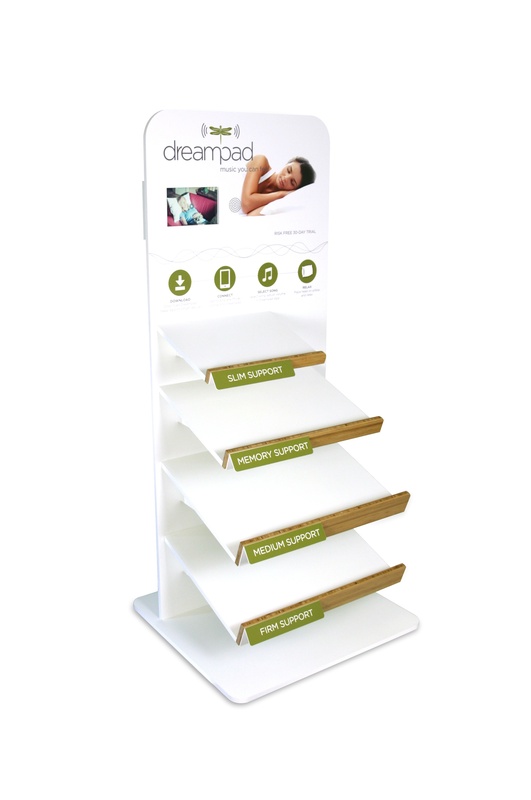 Our 9th example is another MDF display with a white melamine finish. 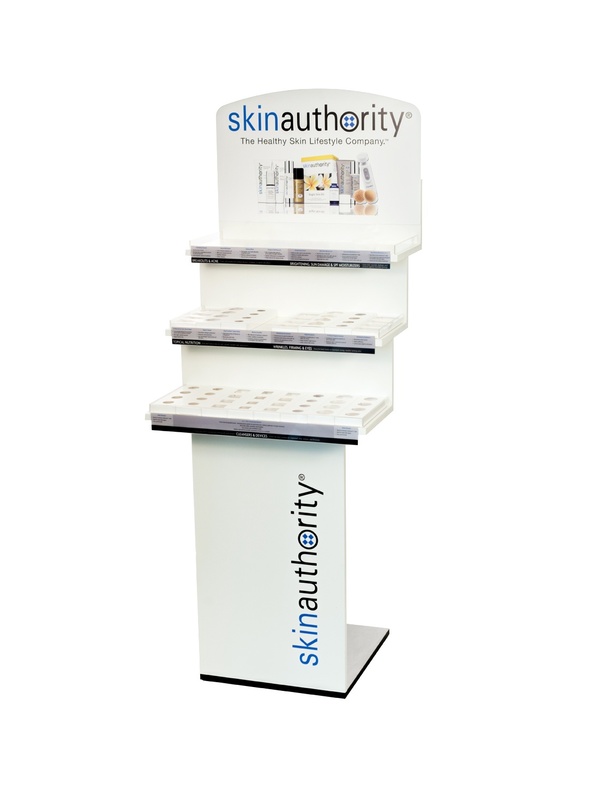 We designed and manufactured this unit for Skin Authority to go in GNC stores. The display is basic and cost-effective. It’s easy to see how the base and header graphics really pop against the white background. We’ll end today with a Sony end cap that we made for Fry’s stores. We used two non-colors on this display- black and white. Instead of MDF we made this entire display of sintra. It was strong, durable, and light weight. The black and white worked well together, particularly given the Sony logo. As we have seen with some of the other examples, the white background also really helps to create focus on the products, which pop against the white background. Although physicists might not define white as a color, when it comes to point of purchase design, it can have a powerful impact.